The newly minted duchess' pages highlight her focus on social issues and notes that she campaigned successfully at age 11 to have a company change the sexist language it used to sell dishwashing soap. The "About the Duchess of Sussex" page also pointed out that she volunteered at a soup kitchen in Los Angeles' Skid Row and worked at another kitchen in Canada while working as an actress in Toronto. "I am proud to be a woman and a feminist," the page quotes her as saying. A second "biography" page mentions her education, first at the Hollywood Little Red Schoolhouse, Immaculate Heart High School and Northwestern University, where she earned a double major in theater and international relations. It also discusses the seven years she spent playing Rachel Zane in the U.S. television drama "Suits." "Whilst working on Suits, the duchess moved to Toronto, Canada where the show was filmed; she feels very connected to Canada, as it became a second home to her," the biography said. 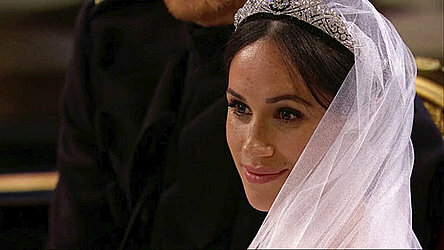 Prince Harry and Markle were named the Duke and Duchess of Sussex as they were married Saturday at St. George's Chapel in Windsor.